Yes, another gem from the California farmer. The angelcot is sweetness wrapped in a smooth velvet skin. 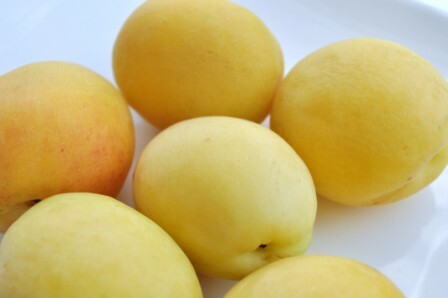 A hybrid of a Moroccan and Iranian fruit, the angelcot is a summer white apricot. 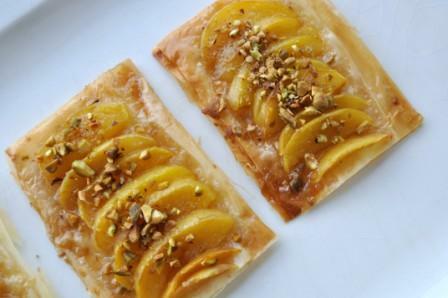 Top angelcots over layers of phyllo and accompany them with pistachios, and you have Angelcot and Pistachio Pastries. 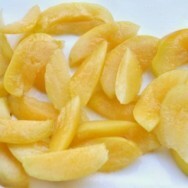 The angelcots play a lead role in these pastries as the intense apricot flavor sweetens this treat. 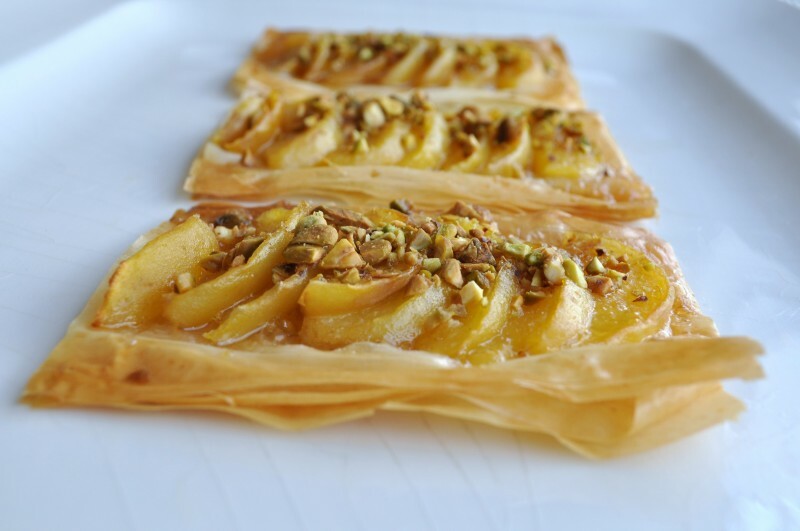 Crisp edges of baked phyllo, smooth slices of angelcot, and a crunch of pistachios; the combination of flavors and textures makes Angelcot and Pistachio Pastries a delight. Serve them hot and fresh from the oven after a long summer day. 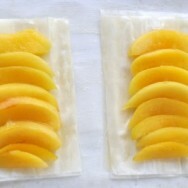 Carefully remove one sheet of phyllo from under the wrap and transfer to a clean work surface. 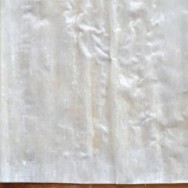 With a spoon, drizzle half of the melted butter on the first sheet, then with the back of the spoon spread the melted butter across the sheet (if you have a brush, the melted butter can also be brushed onto the sheet.) 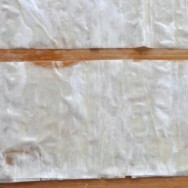 Carefully lay the second sheet of dough on top of the first sheet. Repeat the drizzle and spread technique with the remaining butter on top of the second sheet. To make 8 rectangles, first cut the phyllo in half lengthwise. Cut the phyllo again to quarter, then cut each quarter one last time. Place 4 rectangles on the lined baking sheet, then place the remaining 4 rectangles on top of each to make four 4-layered pastries. Arrange 6-8 angelcot slices in the middle of the top of each pastry, leaving at least 1/4″ border of phyllo exposed on each edge. Sprinkle 1/2 tsp of sugar over each pastry. Bake for 10 minutes. Remove the baking sheet from the oven and sprinkle an additional 1/2 tsp of sugar onto each pastry. Sprinkle 1 tsp of pistachios onto each top. Rotate the baking sheet and return it to the oven. Bake for 5-7 minutes more until the sugar has melted and is bubbly. Notes: This recipe uses 4 teaspoons sugar and was adapted to adjust to the sweetness of the angelcots (the original recipe calls for 8 teaspoons sugar). If you prefer sweeter pastries, adjust the sugar to taste. 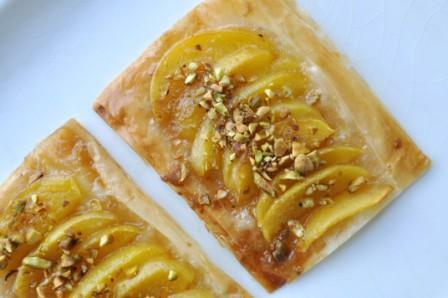 To ensure crisp pastries (and avoid soggy ones), serve Angelcot and Pistachio Pastries hot from the oven. Note on Phyllo. 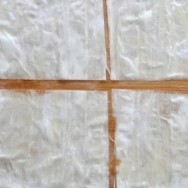 Phyllo dough sheets are delicate. Remember to thaw frozen phyllo dough as instructed by the manufacturer. If the dough is not thawed, it will break into pieces. 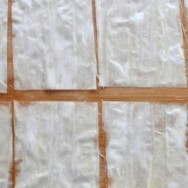 Also If the phyllo dough is too dry, wrap a dampened towel around the 2 sheets along with the plastic wrap. Be aware that if the towel is too damp, the phyllo dough will be very moist. Very moist dough is difficult to handle and will likely rip. The No-Ice Cream Machine Freeze.